Please join us on April 23 at Trinidad Rec Center! 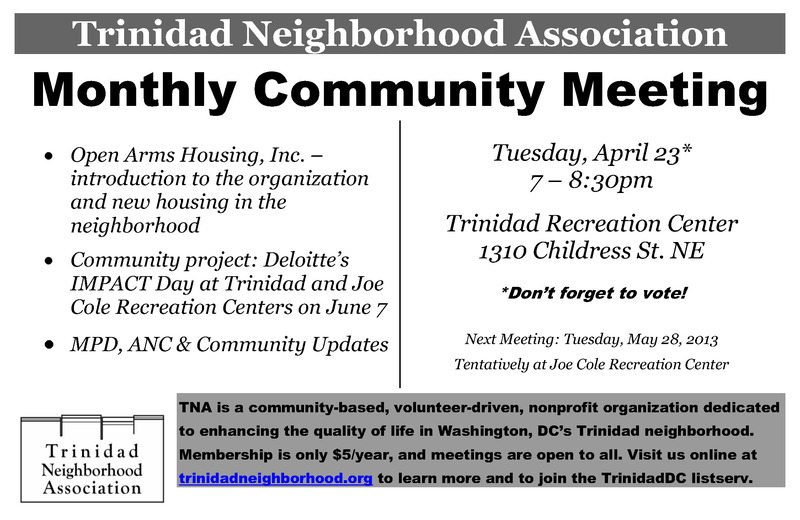 This month, Marilyn Kresky-Wolff, executive director of Open Arms Housing, Inc., will join us with an introduction and to share information on a new, permanent housing site in the neighborhood, and neighbor Dawn Boutelle will discuss the upcoming Deloitte IMPACT Day activities at both the Trinidad and Joe Cole Recreation Centers. We’ll also have updates from MPD-5D and neighborhood ANCs. As always, we’d love to hear your community announcements!